A forecast of low ceilings, thick clouds and rainy weather Thursday has led NASA and Northrop Grumman officials to push back the launch of an Antares rocket and a space station-bound supply ship from Virginia’s Eastern Shore to Friday morning. Launch managers at NASA’s Wallops Flight Facility decided Wednesday morning to bypass a launch opportunity Thursday morning, and instead aim for liftoff of the Antares rocket Friday at 4:23:55 a.m. EST (0923:55 GMT) carrying a Cygnus cargo carrier toward the International Space Station. The predawn launch Friday is timed for when the space station’s orbital plane — or ground track — is over the launch base in Virginia. The delay sets up dual launches Friday from opposite sides of the world to resupply the space station in orbit more than 250 miles (400 kilometers) above Earth. Less than nine hours after the Antares is scheduled to blast off from the U.S. East Coast, a Russian Soyuz rocket is set to fire into space from the Baikonur Cosmodrome in Kazakhstan at 1:14 p.m. EST (1814 GMT). 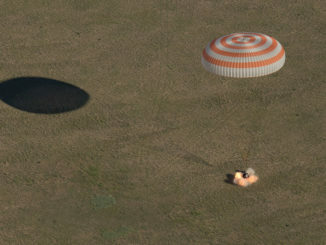 The Soyuz will dispatch a Progress resupply and refueling freighter to the space station. Assuming both cargo missions launch Friday, they are due to arrive at the station Sunday. The weather team at Wallops briefed managers during a launch readiness review Wednesday, and the official weather outlook predicted a 90 percent probability that conditions early Thursday morning would violate the Antares rocket’s launch commit criteria. The weather conditions should improve somewhat later Thursday, with forecasters predicting a 55 percent chance low cloud ceilings or ground winds will prevent liftoff during Friday’s five-minute launch window. 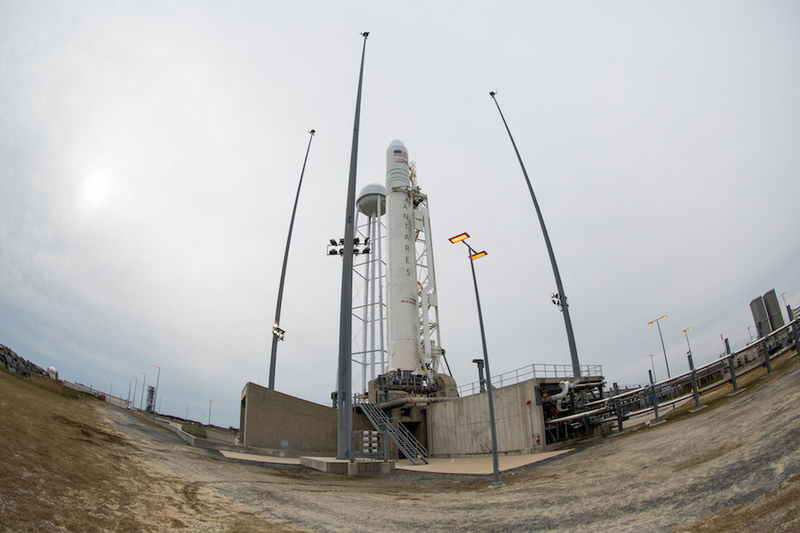 The Antares launch team will meet again Thursday morning to decide whether the forecast is good enough to warrant proceeding with a countdown and launch attempt Friday morning. Another launch opportunity is available Saturday, when better weather is forecast, with a less than 5 percent chance of out-of-bounds conditions. If the Northrop Grumman Antares rocket lifts off Friday, the unpiloted Cygnus cargo craft nestled inside the launcher’s payload fairing is scheduled to reach the space station Sunday around 4:35 a.m. EST (0935 GMT). 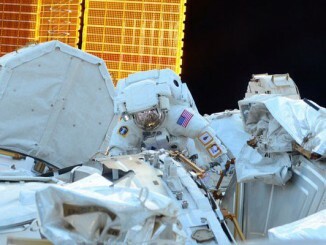 Astronauts Serena Auñón-Chancellor and Alexander Gerst will use the station’s Canadian-built robotic arm to capture the Cygnus, which will be berthed to the Unity module on the orbiting research outpost for a three-month stay. The Progress MS-10 supply ship is scheduled to dock with the station’s Zvezda service module at 2:30 p.m. EST (1930 GMT) Sunday, around 10 hours after the Cygnus arrival. If both missions reach the station Sunday, it will be the first time in the research lab’s nearly 20-year history that two resupply vehicles have made cargo deliveries on the same day. The space station is short-staffed with a three-person crew after a Russian cosmonaut and a NASA astronaut aborted their launch Oct. 11 following a S0yuz booster failure. Another three-person crew is set to launch from Kazakhstan on a Soyuz rocket Dec. 3. The back-to-back cargo ship arrivals Sunday will make for a busy day, but the station crew, led by European Space Agency astronaut Alexander Gerst, will be able to handle the arrivals, said Joel Montalbano, NASA’s deputy space station program manager. After Auñón-Chancellor captures the Cygnus with the robotic arm — with the help of Gerst — the station commander will assist Russian cosmonaut Sergey Prokopyev in monitoring the Progress’s radar-guided automated approach. Montalbano said Gerst has received some refresher training to be able to assist Prokopyev with the Progress docking, a job that typically goes to a second Russian crew member. If the Antares launch slips to Saturday, the Cygnus spacecraft’s rendezvous with the space station would be delayed to Monday, a bit more than a half-day after the Progress docking. With only three people on the station — rather than the typical five or six — Montalbano said some research activities have been reprioritized, but operations have not been significantly impacted. The Cygnus supply ship is set to deliver 7,215 pounds (3,273 kilograms) of supplies and experiments to the space station, including a plastic recycler and 3D printer to advance in-space manufacturing capabilities, and an experiment studying how the human body’s ability to perceive motion, orientation and distance changes in microgravity. The resupply mission will mark the 11th launch of a Cygnus spacecraft carrying cargo to the International Space Station, including a test flight in 2013 and a failed Antares launch in 2014 that destroyed the supply ship seconds after liftoff. 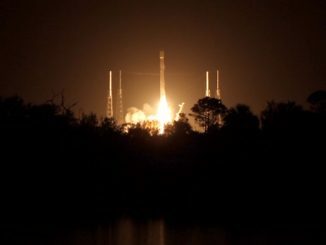 The mission is designated NG-10, and it is the first Cygnus flight since Northrop Grumman acquired Orbital ATK, which developed and flew the previous cargo missions under an 11-launch contract with NASA valued at nearly $2.9 billion. The next SpaceX resupply launch is set for Dec. 4 from Cape Canaveral.